The Housing and Community Development Committee is a resource for members to exchange information about changes and trends in the housing and community development industry and share recent transactions. Members or invited guests present on timely topics. The HCDC meeting format is a brown bag lunch that meets 4-5 times during the year. The group also tours a new housing or mixed-use development each year in June and enjoys an informal cocktail reception at a Boston restaurant in January. To kick off our 2018-2019 series of brown bag lunches, the CREW Boston Housing and Community Development Committee, led by members Kimberly Martin-Epstein and Yanel de Angel discussed recovery efforts related to the devastating hurricanes in Puerto Rico. We were able to conference in Alex Blenkinsopp from Senator Elizabeth Warren’s office. He gave an overview of the PR situation and Senator Warren's efforts to provide aid, including a bill proposed to offer $146 billion dollars in aid to Puerto Rico. While not progressing legislatively, this bill changed the tenor of the conversation in Washington. This is the first time a US territory in economic crisis has concurrently been hit by a natural disaster. As Director of Development at the affordable housing provider Homeowner’s Rehab (HRI), Jane Carbone coordinates all aspects of housing development from the predevelopment phase through construction. HRI owns and operates over 1250 units, housing hundreds of low income families. Too often, low-income neighborhoods lack access to farmers’ markets or stores selling a wide variety of fresh fruits and vegetables. When such foods are available, they can be priced too high for families that need to stretch their grocery budgets. Oftentimes, they will fill the gap with less nutritious, bulk, packaged foods with a longer shelf life. 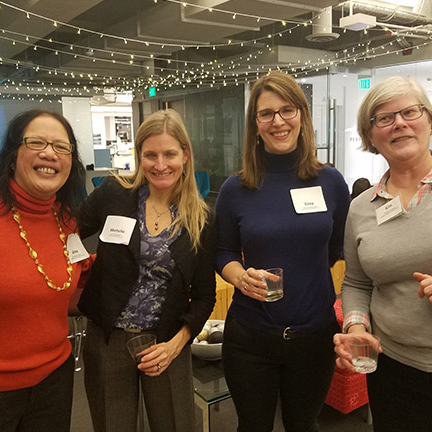 Members connected in the new year with new and current members of the Housing & Community Development Committee at their annual evening social, hosted by Perkins + Will. Members had a great night of food which included a tour of their space. Michelle Apigian of ICON architecture gave an overview of The Distillery in South Boston, the region’s first passive house apartment building, as part of the Housing and Community Development Committee’s annual Project Tour event. Attendees also toured the Patriot Homes and ended the evening at Coppersmith for networking.